Chopped apples, raspberry jam, oatmeal, and ricotta cheese help make this a delicious cake, down to the last crumb. This is a guide about making apple raspberry crumb cake. Heat oven to 350 degrees F. Lightly grease 9 inch springform or round cake pan. For cake and topping, combine dry ingredients; mix well. Cut in margarine and Ricotta cheese until mixture is crumbly. Reserve 1 1/2 cups oat mixture for topping; set aside. Combine sour cream and egg whites; add to remaining oat mix, mixing just until moistened. Spread batter over bottom and 1/2 inch up sides of prepared pan. 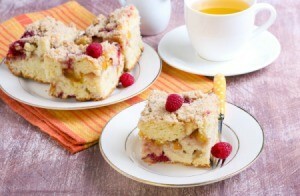 For filling, combine apples, jam, and flour; spoon over cake. Sprinkle reserved oat mixture over fruit. Bake 50-55 minutes or until golden brown. Sprinkle with powdered sugar. Serve warm.